I love Shirley MacLaine! She's so thoughtful and open and knows how to express herself and her beliefs. She's never been afraid to speak her mind (one of the reasons I like her so much) and has put down many thoughts, ideas, and experiences in her books. This one's during a different time in her life, where she's over so much of the drama one endures through life. In this book you'll get a headstart on what's not worth worrying about (the sooner you know, the sooner you can let go) and what you should concentrate on. I love Ms. MacLaine because we both think along the same lines in many instances. I agree that we predetermine our lives on Earth, that there's other life "out there", I believe in reincarnation, and that people use fear to control others. I loved this sentence of hers: "Learn how to propagandize fear and you can control civilizations and make a lot of money". Just what the powers that be have done and are doing. Ms. MacLaine also relates many stories of her co-workers, films she's made, loves and lovers in her life, her travels, experiences, and astute observations of humans. She generously shares this with a good dose of humor. Her outspokenness is contagious—I've got to practice and work at this. The lessons Ms. MacLaine imparts are invaluable and her words are worth considering. It's alarming how dismissive we've become of those who are "different"—mostly because of the "religion" rammed down our throats. Read and ye shall understand. 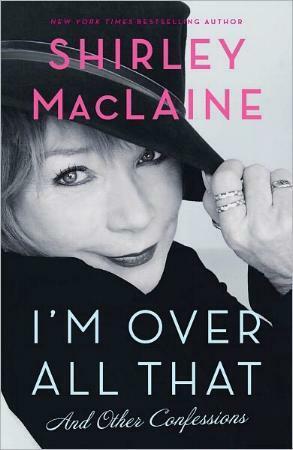 Being over many things is not only what Shirley MacLaine writes about, she also looks at the other side and talks about things she'll never get over, like Africa, or making money (this chapter is enlightening), or our Founding Fathers. I feel so attuned as she talks of the global banking elite, UFOs, aliens, no devil, etc., etc. I'd give anything to sit and chat with Ms. MacLaine and to learn from her experiences firsthand. I think she's infinitely interesting, not to mention talented. I also love that she's involved with helping animals and animal rescuers. See my review of her book Sage-ing While Age-ing. Conclusion - Food for thought. Big time! Do yourself a favor and read this fascinating book.